Several dozen people sat in a waiting room, each holding a ticket identified by a different letter and number. "Come on, A72," a man wearing a red fleece jacket chanted periodically, as if he were cheering on a racehorse. A bored teenager tried to amuse himself by methodically rolling what looked like a joint — but turned out to be his ticket. When a digital sign flashed "A72" a few minutes later, the man in the red fleece jumped up. "Good luck!" said the woman next to him. Fifteen minutes later, her number appeared on the screen. She gasped as if she'd won the lottery. I kept waiting, eyes on the screen. Since the state agreed to change the way it issues driver's licenses, a record number of Vermonters are making this dreaded pilgrimage to the Vermont Department of Motor Vehicles in South Burlington. Almost everyone shows up clutching a manila folder full of important documents that would be safer left at home. Until recently, maintaining the right to operate a motor vehicle in Vermont was a relatively painless process. The DMV notified drivers when it was time to renew their licenses — for two or four years; the choice was yours. It was all done through the mail except for when, every eight years, you had to go in to the DMV to get a new photo. Things changed in 2014, when Vermont started replacing expiring driver's licenses with REAL ID ones. Now, instead of mailing in the renewal form, Vermont residents have to show up in person at the DMV, with photo identification and proof of name, birth, Social Security number, legal status and permanent address. In some cases, original-source documents are required. Several of the terrorists who hijacked planes on September 11, 2001, got on board using fraudulent driver's licenses. In response, Congress passed legislation to mandate a more stringent and uniform process for obtaining them. At some point — no sooner than 2016, according to the Department of Homeland Security — people won't be able to get on a plane using an old-fangled driver's license as a form of identification. Why has it taken so long to implement a law that passed in 2005? Homeland Security has repeatedly delayed implementation deadlines in response to pushback. Some states have denounced or altogether banned the new ID, which has been criticized as a veiled attempt to establish a national identity card. In Vermont, the House passed a resolution objecting to the law. 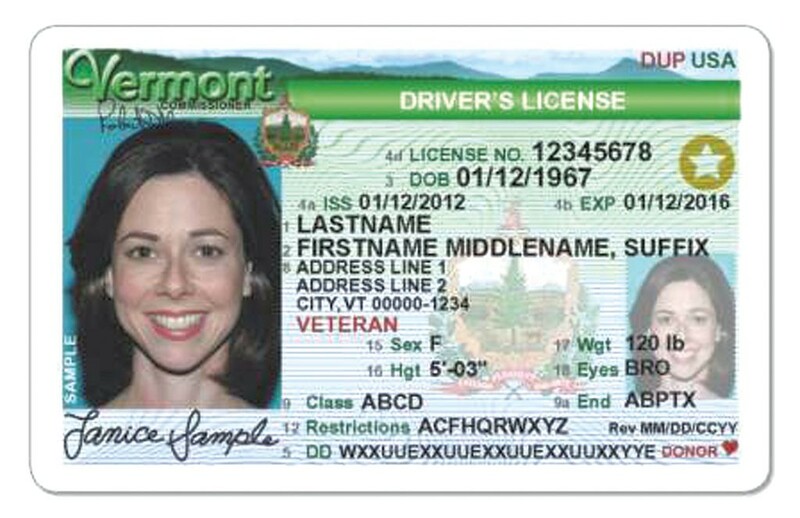 But Vermont's DMV has embraced the REAL ID, and it started issuing the new licenses in January 2014. The new cards are almost identical to their predecessor, and cost the same: $48 for a four-year license. The main difference: Vermont drivers must go to greater lengths to prove their identity. Vermont's 11 DMV offices are processing roughly 1,100 additional transactions a month, according to director of operations Michael Smith. Acknowledging that the rollout had been "bumpy" and instructions in the department's mailings and on the website "clear as mud," he said, "I think there were some hiccups, and we clearly could have done a better job communicating in the beginning." The DMV addresses frequently asked questions about the REAL ID on its website — the document is 11 pages long. "It's slowly gotten better, and we will continue to get better," Smith promised. When I discovered that my California driver's license had expired a few weeks ago, and I'd need to get a Vermont one, I anticipated a Kafkaesque excursion. Nationwide, DMVs are already emblems of all that is bad about bureaucracy: long lines, opaque instructions and surly officials. During my last trip to a California DMV, I waited in line for nine hours and, at one point, called my parents in tears. Now back in Vermont, and worried that I might wind up with the wrong kind of driver's license, I decided to get the REAL ID. The state also offers two other types of licenses: enhanced licenses and driver's privilege cards. The former, which Vermont began offering in 2009, cost an additional $25 and can be used in lieu of a passport when returning from Canada, Mexico, the Caribbean or Bermuda. All enhanced licenses are REAL IDs but not all REAL IDs are enhanced. Unlike a regular REAL ID, the enhanced one contains new technology — an embedded radio frequency chip that allows border officials to access cardholders' personal data as they approach the checkpoint. The DMV created driver's privilege cards at the same time as the REAL ID, after the state passed a law allowing undocumented people to drive. Foreign farmworkers isolated on rural Vermont farms led the advocacy effort that resulted in this third option. Like the REAL ID, it costs $48 and requires a photo, but applicants don't need to prove their legal status. If a Vermont resident doesn't want to endure a trip to the DMV, he or she can request a driver's privilege card by mail. The drawback? If the Department of Homeland Security starts requiring the REAL ID, a privilege card will no longer get you on a plane. Plenty of people are showing up at the DMV bewildered by these changes. Last week at the South Burlington branch, even those who'd read up on the rules ahead of time ran into problems. It was Barb Pitfido's second trip to the DMV. Reaching into her purse, she pulled out the birth certificate that got rejected the first time. Issued by the hospital where she was born, it looked legit, complete with a gold seal and ink prints of her infant feet. But the DMV needed a certificate issued by the city, not the hospital, which Pitfido had to request by mail. Post-processing, some people weren't even sure which license they got. A star in the upper right corner denotes a REAL ID. An enhanced one looks the same but reads "enhanced" under the star. Driver's privilege cards are identified as such, with the added qualifier: "not for federal identification." Rick Duckworth of Waterbury said he got a REAL ID because a DMV employee "made it sound foolish not to." That kind of advice concerns Allen Gilbert, executive director of the Vermont American Civil Liberties Union. "It's been pretty clear that the information that has been sent out concerning the REAL ID or given to people at the counter has been, at best, misleading." Gilbert, who recently got a driver's privilege card, thinks the DMV should make it clear that the REAL ID isn't the only option. A number of people have figured that out. As of April 26, 44,961 Vermonters had taken home driver's privilege cards — far more than the roughly 1,200 migrant workers for whom they were intended. During the same timeframe, the department has distributed 193,760 REAL IDs. Smith said he's surprised so many people are choosing privilege cards. He assumes they're either politically opposed or opting for the path of least paperwork. I was prepared when I went in last Wednesday. I grabbed my passport (requirement 1) and pawed through the recycling bin to find two pieces of mail (requirement 2). I discovered I had no clue where my Social Security card (requirement 3) was, but I did find my W-2, which also does the trick. Bracing for a lunch break rush, I arrived at the South Burlington office at noon. I walked in the door just as another patron was picking up her license. "I just want to tell you, you're amazing," she said to the woman working behind the counter. "You're smiling," she explained to the surprised employee, who was serving on the frontlines — turning away people who lacked the proper documents. It was the first indication that the experience might be better than expected. Only five of the 15 counters were open — workers were presumably at lunch — but things were still moving quickly. With little to gripe about, people in the waiting room shared war stories, reminiscing about previous trips to the DMV. "Last time I was here, the computer was down," one man recalled. Another pronounced a DMV in Denver the worst in the nation. I was summoned approximately 20 minutes after I handed in my paperwork. After a woman spent five minutes verifying my documents, she directed me to a camera booth and recited a scripted line: "Smile, if you wish." The next morning, not everyone had it so easy. A mother on her way out didn't want to talk about her experience. It was cold and blustery, and she said her two young daughters were freezing after waiting in line outside. "It's lame," said a lanky man in a camo sweatshirt, referring to the REAL ID. He had accompanied his brother, who had trouble verifying his address because he gets mail delivered to a post office box. The brothers live with their parents in Burlington, so their names aren't on any of the bills. Shipping labels from a FedEx box finally did the trick. A woman making her fourth attempt to get a license began yelling at the employee reviewing her documents. Pitfido, who got an enhanced license on her second try, was more laid-back. "It's a pain for a week," she said. "But I think it's worth it to make sure everyone is who they say they are."